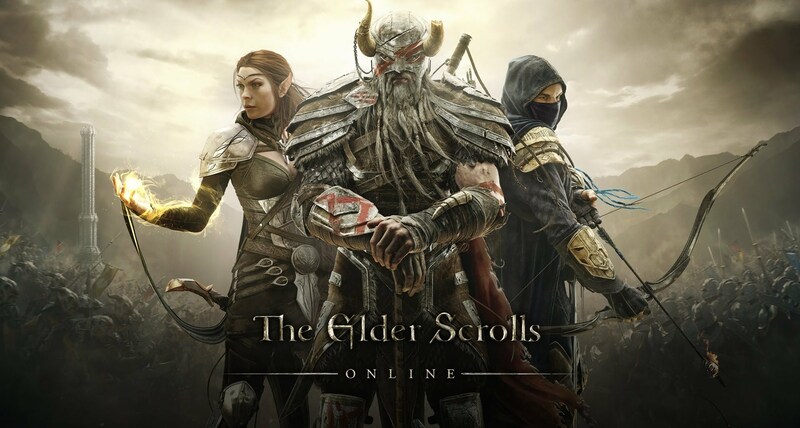 The Elder Scrolls Online (ESO) beta testing phase is over and Cyrodiil revealed to be exactly what I predicted last month – a lag feast of massive zerging. The promise of an epic PvP system based on choices and engaging experiences seems to be a mere utopia that is far from leaving the concept world. Regardless the lack of PvP options in ESO, the massive battling system could deliver something spectacular or rather unique. However, this is not the case. 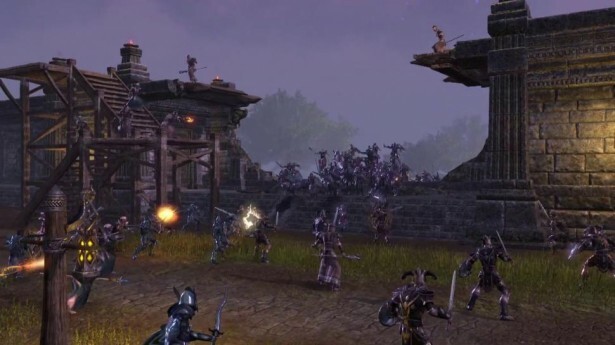 Cyrodiil appears to be a reproduction of Guild Wars 2 World-versus-World-versus-World system, where massive numbers of players from each faction battle for territory dominance. The only major innovation in the whole system is the Emperor title that crowns the player from the winning alliance with the most points (and all his/her followers) with a special bonuses tree. But even this feature has its own controversies, since it only takes one hit to earn alliance points and an assistance to earn an extra bonuses tree. But that’s no surprise, I suppose. In a system of masses, you can’t expect anything else but a massive and disperse reward. Path of glory – follow the main army for supreme dominanace. Game director Matt Firor claimed that “ESO is about choice” but when it comes to PvP the only choice is Cyrodiil. I guess in this case, the only feasible option is to choose between entering Cyrodiil, the exclusive PvP map, or keep adventuring into solid environmental land. It’s true that Cyrodiil is capable of proportionating different types of battles but in general, conflicts are always massive and colossal. Taking part of massive battles is inevitable and the chance to find a fair fight anywhere is close to zero. There’s too little space for strategy, tactics or skill for all that matter because the most crucial rule in massive combat is to follow the masses and hope for the best. Since the only way to stand a chance against a wave of enemies is to be among a wave of allies. Otherwise, the result is obvious – proficiency won’t bring salvation. There’s absolutely nothing wrong with massive combat systems. In fact, it can be really fun at times but that’s mostly because players spend more time watching the battlefield rather than fighting themselves. In the middle of so much chaos and disorder, there’s indeed nothing much to be done and that’s exactly when the insignificant sensation might rise up to destroy all the fun. After all, it’s not like one more arrow, fireball or sword hit will be able to change the outcome of the battle. And even if shooting a siege weapon might feel meaningful at times, it will eventually start to feel tedious for the mere fact that shooting at a wall is everything but amusing. But all this seems secondary when facing the real pandemonium. What to do when your screen is filled with enemy and allied players? Who to shoot first, where to take cover, what’s the main objective? One thing I noticed while fighting in Cyrodiil was the fact that there’s no visual differentiation between players until your cursor passes by someone who’s enemy. This lack of distinction increases the chaos and confusion levels in the battlefield and in my opinion, it’s quite annoying. I know it’s a medieval game and ESO aims for realistic and immersive features; however this is far from being realistic. In medieval times, armies always carried some kind of distinction in their armors, such as colored plums. I find it quire miserable to be in the battlefield trying to realize who exactly your enemy is but well, at least there’s no friendly fire, else the entropy levels would reach unplayable standards. Finding enemy players is not as easy as it seems. Nowadays, it seems like everything that is easy has become fun but does fun always stand for easy? In ESO’s logic the answer is yes. Isn’t it why the only PvP system implemented is based on quantity rather than quality? 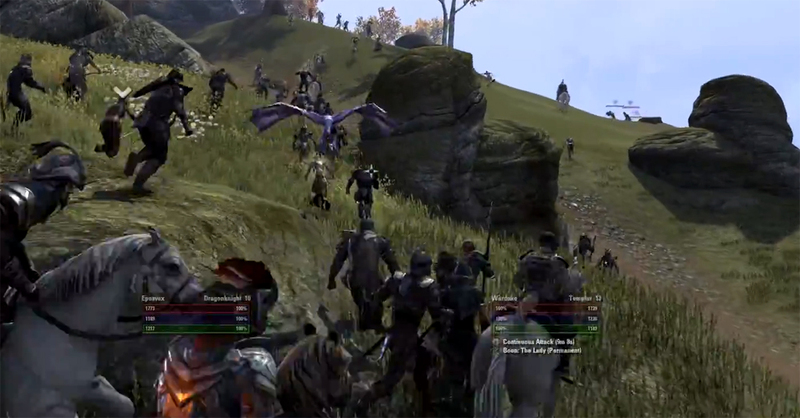 Bethesda/Zenimax could have made something very different or at least present a legitimate choice for PvPers but instead they’ve created a massive system, where all players can do is join forces in huge groups and conquer certain points. If this is not easy-mode then I don’t know what is. In fact, I don’t think they had any other option than to make the whole system quite simple and easy because the great challenge lays in finding your enemies and hitting them, else how are you supposed to farm alliance points and compete for the Emperor title? Indeed, it all fits together.